Evelyn enjoyed her second visit to Ocean City, Maryland, last week. She had lots more fun this year than during her first visit. She posed for the camera in her bikini. She jumped the waves with her friend Annika. 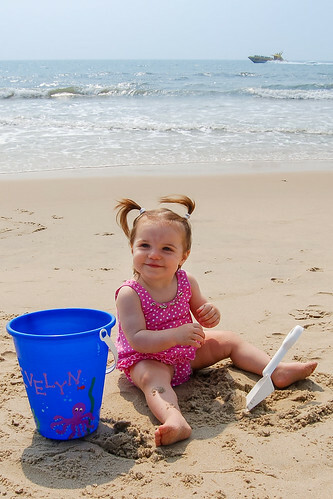 She played with her bucket in the sand. She got tired of us taking her picture. All in all it was a good time. You can tell by the amount of sand that made it back to our house. 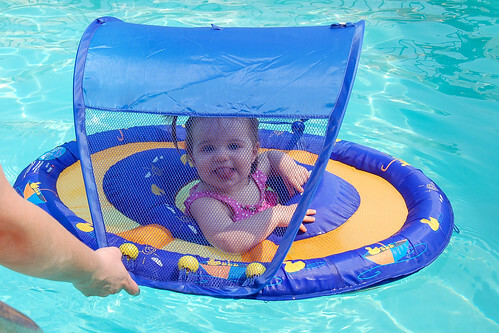 What a cute bathing beauty. Now, if she could just figure out where do-do, wheel, and rah er are, she'd be in business. What a great time we all had at the beach. I'm glad she got to jump waves and play with her bucket in the sand. I think she enjoyed herself much more than last year! Next year will be even better. Can't wait.